Newport County boss Warren Feeney says Chris Wilder has done ‘an unbelievable job’ and the Cobblers will be worthy champions of Sky Bet League Two - but is still backing his Newport County team to upset the odds when his side turn out at Sixfields on Good Friday (ko 3pm). 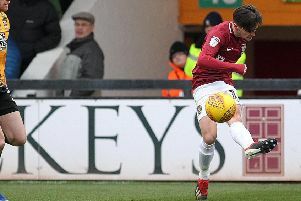 The Exiles are going into the game on the back of a 4-1 home defeat to Bristol Rovers, but Feeney believes his team are capable of quickly bouncing back and making their mark on Northampton. Just two weeks ago Newport also travelled to Portsmouth as huge underdogs, and returned to south Wales with a 3-0 win under their belts, and Feeney feels there’s no reason why his team can’t repeat that success at Sixfields. “It’s a fantastic game,” said Feeney. “Chris Wilder has done an unbelievable job when you look at the position they were in at the beginning of the season when they weren’t getting paid. “He’s a fantastic manager who knows the league and they will be champions. “They deserve to be champions, but it’s a great game for us to go and play against a team that’s top of the league. “They’ve been by far the best team this season and they haven’t lost games, but all we can do is put on a performance and hopefully get a result. “It’s a free game for us. People will look at where we are in the table compared to them and we’ll be written off. Feeney shrugged off the defeat to Rovers, which followed on from a disappointing 0-0 midweek draw with struggling Hartlepool United, and said: “There have been ups and downs in the last few games but we’re in a good position. Newport strengthened their squad on Friday with the loan signing of Peterborough United striker Souleymane Coulibaly, but the Ivorty Coast Under-20 international is unlikely to be allowed to play at Sixfields due to problems getting the international clearance. A statement from Newport County read: “Unfortunately following confirmation that the FIFA Offices closed at 11am GMT on Thursday morning, it is unlikely the club will be able to gain International Clearance for the player until Tuesday at the earliest. “Both The FA and FAW are assisting us in trying to contact FIFA out of hours. Feeney told the club website: “It’s very frustrating, as today is a working day for everyone.